Science-fiction movies have always inspired new technologies that improve human life, from flying cars, to 3D printers to facial recognition. We now live with exponential technologies at our fingertips… so who knows what the future will look like in the next decades? Most Sci-fi movies, however, depict a dystopian future where technology has a negative impact on human life or extinguishes it altogether. 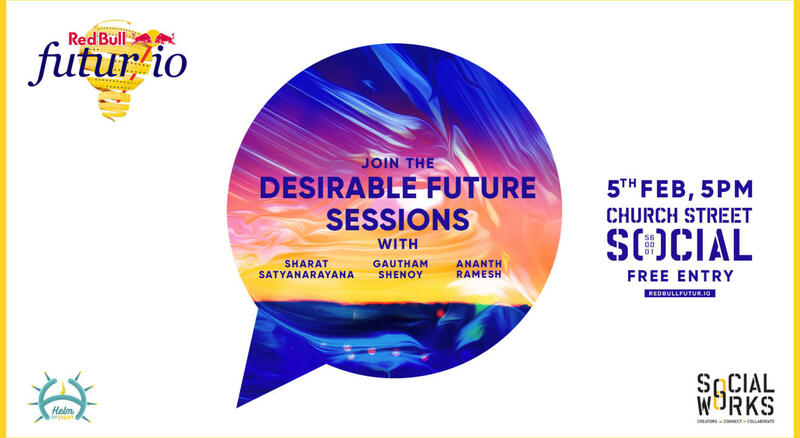 Red Bull Futur/io takes a stance by inviting disruptive minds (visionaries, techies, writers and storytellers, etc.) to share their visions of a desirable future in 2030 in the form of a 60 second video. Join a 2 hour long conversation with the friends of Helm of Eight as they take a deeper dig on what their take on future is and how to empower your vision of making a change. Sharat Satyanarayana refers to himself as an ‘aspiring nexialist‘. A parallel entrepreneur who loves testing new ideas that push the boundaries of creativity. A creative person managing with limited motor (for art) & tech skills, Sharat has contributed to and developed deep technology innovation programs at leading retail firms such as Target (in collaboration with IDEO & MIT Media Lab), LOWE'S Home Improvement & Pantaloons. Gautam Shenoy has spent almost 20 years in the advertising industry. Until recently the National Creative Director of Saatchi & Saatchi Focus, he is currently a Consulting Partner at Celsius 100. An avid reader and science fiction fan, Shenoy is also a columnist for factordaily.com where he writes New Worlds Weekly, India's longest-running weekly column on Speculative Fiction. Ananth Ramesh is a Structural design working with TeamIndus for the last 5 years. A graduate from Cranfield University, he joined TeamIndus during the initial days of the Lander Structures team. He is in charge of the design analysis and optimization of the spacecraft and has played key roles in building the two-engineering space qualified models of the lander. He is also a part of several foundation programs where he actively engages the next generation by taking them behind the scenes of the Moon mission and igniting an interest in STEM careers. SocialWorks is where creators connect and collaborate. It is a coworking space that blends the best of #work x #play, by offering registered individuals office benefits by the day and a high energy bar by the night. SocialWorks builds various communities by offering skill development exercises like Workshops, Panel Discussions, Guest Lectures and networking evenings attended by who’s who of the town. Besides on-the-house access to WiFi & office stationery, members get to attend these events for free! SocialWorks connects its members to various products / services, ranging from the country’s top Incubators to a Lifestyle Brands, with the aim of making daily life easier, professionally and personally. Members get to access all benefits, pan India, with a subscription that is based out of any city (currently Delhi, Mumbai, Bangalore, Pune & Chandigarh), any outlet (23 and counting)!